When Michael Welch lost socks, we sent him socks. When Kellan Lutz said he loved lollies, we sent him lollies. When Jackson Rathbone mentioned that he goes through guitar picks faster than we all read Breaking Dawn, we sent him guitar picks. The time as come to show a little love towards the villains! 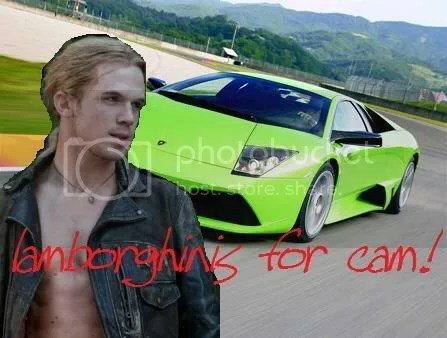 I cannot ignore Cam’s cry for lamborghinis. Just as others could not ignore the other star’s cries for various things. We must buy him lamborghinis. Alternatively, you can do what I’m going to do: send Cam some minature toy lamborghinis. Then, when doll James comes out, he can play pretend like Pete Wentz does with his Fall Out Boy dolls and Barbie. Please show your support! Send cars – minature or human size or even a photo of a lamborghini, straight away! COME ON! Cam won’t be expecting this! The others asked for reasonable things. Things they knew they’d get. Not Cam, Cam knew to ask for the unexpected. Cam isn’t expecthing anything. Well he is so wrong. I’m serious, I want his fan mail office absolutely flooded with tiny little minature lamborghinis. Go. Now. Please. Thank you! hey omg great idea. i was looking for some way to send cam a lamborghini. but did u know that if a million twilighters send cam 40 cents, then he can buy a lamborghini because their price is down. i really wanna do that. lambos for cam!